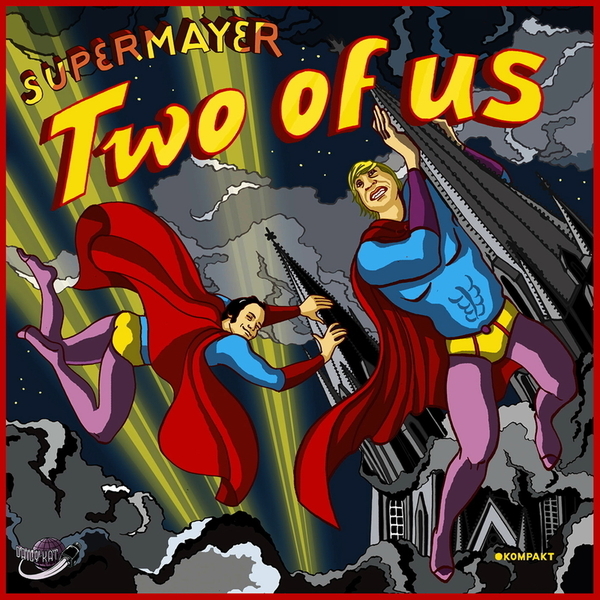 Kompakt superstars and not-very-odd couple Michael Mayer and Superpitcher team up for a first 12" outing as an item (in musical terms at least), combining their production savoir faire for the chummily-titled 'Two Of Us', which reads more like a bad sitcom than a dancefloor banger. Fortunately, the track is every bit the grandstanding epic you'd hope it to be, taking several spades worth of percussion and laying it on thick for some slow-building cologne techno. Seemingly from out of nowhere, a glockenspiel phrase of Sugar Plum Fairy proportions crops up, lending the whole affair a distinctly kooky character that somehow manages to work out just fine. After the epic proportions of the A-side, the flip sees Geiger wading in with a handy remix that distils some of the more firmly floor-friendly elements from the original, followed by a glockenspiel-centric re-edit.